Shamus Award has laid claim to the title of Australia's top three-year-old with a brilliant win in the Australian Guineas at Flemington. Having followed the unexpected with the unprecedented, Shamus Award is now out to establish himself as a three-year-old without equal. Shamus Award, who is now the first horse to add the Australian Guineas to his surprise Cox Plate success of last spring, is likely run in next week's Group One Australian Cup before a Sydney campaign culminating in the $4 million Queen Elizabeth Stakes. "He's done what very few three-year-olds have done by winning a Cox Plate, but to back it up with a Guineas it puts him in very rare air," said trainer Danny O'Brien. 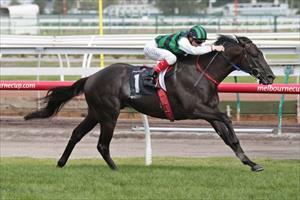 As he did in the Cox Plate, Shamus Award went straight to the front and was never headed. With his ambitious autumn in mind, jockey Craig Williams eased Shamus Award ($4.60) to the line to give the colt his second Group One win by a length from Criterion ($11). Thunder Fantasy ($15) came from the rear to finish third, a further head away. O'Brien said Shamus Award had "better than a 50-50 chance" of tackling the Melbourne Cup winner Fiorente in the Australian Cup - and had every chance of repeating his Cox Plate defeat of the Gai Waterhouse-trained import. "In the Cox Plate he beat all the horses he meets in the Australian Cup. He's still fresh, so it won't do him any harm to go around again," he said. O'Brien's program then takes in the Group One Rosehill Guineas on March 29 and the Queen Elizabeth, also at Group One level, three weeks later. And then O'Brien will focus on a repeat of the effort of So You Think, the last horse to win successive Cox Plates. "We've definitely got one eye on this year's Cox Plate," he said. "Obviously it's not often you get your chance to win a second one as a four-year-old. "We saw So You Think do it, we'll try and do what he did." In only his second start this time in, Shamus Award raced keenly until the turn in the 1600m race, but Williams didn't fight him. "I wanted him to be as comfortable as he could be," Williams said. "He was fresh, he didn't do himself a lot of favours. "But he was just too good for them."